Every parking lot job we undertake at Unlimited Professional Services is done while keeping all of the applicable rules and regulation in mind and that’s why signage and wheel stops are taken seriously by all of our associates. When you hire us for a job, we’ll provide bright, durable traffic markings that dry quickly and last a long time. This helps facilitate a better and efficient traffic flow as well as keeping cars and pedestrians safer. As a full service provider of parking lot striping and maintenance, we can also paint wheel stops & various concrete barriers in various lengths and styles to match your aesthetic and safety needs. Read more about our parking lot services in the Triangle. In North Carolina, it is important to have federally approved signage for parking lots, roadways and pedestrian crosswalks. 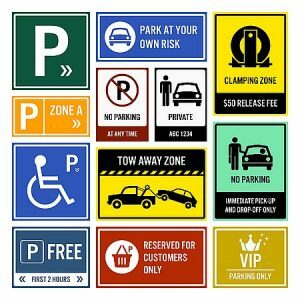 It is best to go with an experienced and knowledgeable parking lot service provider like Unlimited Professional Services that is up to date on all applicable signage rules and regulations that concern parking lots. From handicapped parking signage to speed and loading zone markings, we are the parking lot service provider to turn to for safety and security signage. The technicians at Unlimited Professional Services have years of experience installing personalized signs for parking lots, private use, street name signs and MUTCD conventional signs. At Unlimited Professional Services we are fully capable of installing and/or mounting your various signs as required to fulfill any specification regulation or rule. Wheel stops or fender blocks are needed for multiple security reasons. To help drivers align their vehicle when pulling into a parking space, to signal to the driver when the vehicle has pulled all the way into the parking space, to reduce the danger of accidents in parking lots by preventing drivers from pulling forward to leave a parking space or to indicate when a parking space is reserved for handicapped vehicles. We can paint them any colour you need to ensure all your security needs are satisfied. Appropriate signage is essential for an orderly, safe parking lot. Pedestrians and people driving cars need to know where cars cannot park along with the direction in which traffic is supposed to flow, who has the right of way and where pedestrians are supposed to walk. Handicapped spaces, stop signs, speed limits, fire lanes, loading zones, reserved spaces and other signage should be posted in the appropriate places and at the proper heights. Some signs are not necessarily required, but others are covered by state or federal regulations that will set the size, location and type of mounting that must be used. At Unlimited Professional Services, we always stay up to date on the regulations that are constantly changing. Additionally, we are adept and staying current with industry recommended practices for parking lot signage. 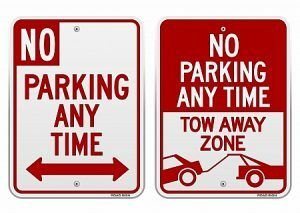 We can help you ascertain the appropriate configuration for the parking lot signs and install them correctly. Not only do we get your signs installed properly, but we are all about making sure your facilities have full ADA compliance.